Across the U.S., there’s a growing recognition that art and culture can drive community and economic development. But it’s rare when those artistic efforts include rural communities and their colleges, or focus on bringing together all parts of a community, including its poor and working class residents, for development that is equitable. A new initiative, Performing Our Future, is creating a model for how to do just that. Over a two-year period and with funding from the Doris Duke Charitable Foundation, ArtPlace America, and the National Endowment for the Arts, three communities in different geographic locations will demonstrate how artistic expression leads to community-wide empowerment and how the assets of local culture can develop economic sustainability. A union of economists, artists, and scholars is behind the initiative’s methodology: the rural arts and humanities institution Appalshop and its Roadside Theater; the economists and students at Lafayette College’s Economic Empowerment and Global Learning Project in Easton, Pa.; and the national consortium of 100 colleges advancing public scholarship, Imagining America: Artists and Scholars in Public Life. Key elements in the methodology include creating public performances based on local stories and mapping community assets to identify opportunities for value and wealth creation through market exchange. To enrich learning, ensure national impact, and develop and disseminate findings, the three local projects will interface with each other and with the national research team of economists, artists, scholars, and students. The local college partners in each community will be drawn from Imagining America’s network of more than 100 higher education institutions elevating higher education’s public purposes. One of the project sites is Appalshop’s home of Letcher County, Ky., a county in the nation’s poorest and sickest congressional district, which has developed and enacted Performing Our Future’s methodology for two years. Through Appalshop’s award-winning films, radio, music, and theater productions, community residents are exploring new strategies for entrepreneurship to replace the decline of the coal mining industry. In collaboration with Lafayette College’s Economic Empowerment and Global Learning Project and Imagining America, Appalshop is leading a process for its community to translate the region’s cultural assets into new and expanded businesses, leadership development programs, and tourism. Core research questions for Performing Our Future include the ways in which culture and artistic expression shape individual and community identity, expand imagination, and influence microeconomic incentives and behavior. The research will draw on the learning of Lafayette College’s Economic Empowerment and Global Learning Project, which, in addition to Appalachia, has undertaken successful projects in Easton, Pa.; rural Honduras; the Lower Ninth Ward in New Orleans, La. ; and Jamaica, winning recognition as a model of public scholarship – a rigorous research process that is driven by community expertise, and which fosters a rich environment for discovering new knowledge and student learning. Lafayette College’s participation is supported, in part, by a generous gift from trustee George Jenkins, Class of ’74. 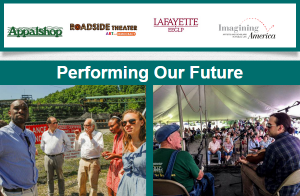 Dudley Cocke, artistic director of Roadside Theater, and Jamie Haft, assistant director of Imagining America, will co-direct Performing Our Future. Gladstone “Fluney” Hutchinson, associate professor of economics and director of Lafayette College’s Economic Empowerment and Global Learning Project, and Scott Peters, professor in the Department of Development Sociology at Cornell University and faculty co-director of Imagining America, are co-principal investigators of Performing Our Future’s research.